This iceberg near Columbia Glacier had a nice hole in the middle of it. 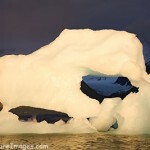 I lined the hole up with a colorful iceberg in the background and had Troy paddle in the gap between the two bergs. The rich almost crystal looking iceberg in the background is the result of extreme pressure from deep within the glacier. Further back is a blue iceberg. The blue is from the portion of the iceberg below the water surface. It is showing here because the low tide has left the blue iceberg grounded. 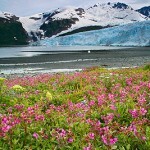 The Columbia Glacier area is a dynamic environment. Unfortunately when we were there it rained hard the whole time and we never did see the glacier. Here is a shot of Columbia Glacier from a few days before in much better weather. 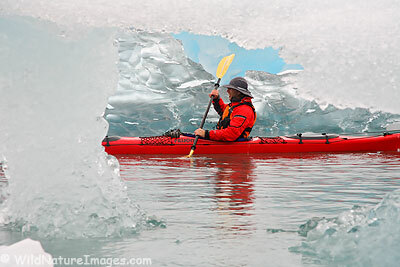 We now have a page of nothing but kayaking photos! Hey Ron, I didn’t know you had a blog. 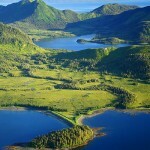 This is awesome to see Alaska thru your eyes, I will have to stop by regularly. Thanks Richard, it is fairly new. I didn’t realize you had a blog – I have been enjoying it this a.m.!